I once listened to a conversation between Mother Teresa and my mother at a meeting in the Bronx. They were like two neighbors chatting over a backyard fence. Among the things hidden from the learned and the clever are the glories of heaven. There are glories of human intelligence and design on this earth, but the eternal glories of heaven are revealed to children, who have no desire to outwit God. The child expects God to be God. God's heaven is no stranger than God's earth. To a child, gates of wood and gates of pearl are equally wonderful, and a sea of water and a sea of crystal are both remarkable only in that they are seas. Our Lord says, "Unless you be converted and become like little children, you cannot inherit the kingdom of heaven." Our first ancestors did not have childhoods, being born fully formed from the dust of the ground and the side of man. So great was their intelligence that they could delight God by reason as happily as children can delight God by lack of reason. Yet intelligence is no vaccine against pride. Adam and Eve did not want to be like children, for the cleverness of evil had persuaded them to want to be like gods. They could not be like gods, but they did stop being like children. Those who will not be childlike will be childish. Adam hid behind a tree because he was ashamed of himself. To be childlike is to love God. To be childish is to envy God. Our God could have come to us any way He wanted 2,000 years ago. He willed to come down from heaven through a human mother because we can only go to heaven through a human mother. The heavenly Jerusalem is mother of us all who have received the gift of life in the womb of a woman. St. John, writing the Book of Revelation, saw a 14 great multitude, which no man could number, of all kindreds and people, and tongues ... before the throne, and before the Lamb, clothed with white robes, and palms in their hands." Our Lord offers the same gracious greatness to every generation by giving all of us the same mother. From the cross in unspeakable pain, covered with blood, He said to you and me: "Behold your mother." Once my mother and I were looking at a famous painting of Mary weeping at the foot of the cross. I went on about the artist, his style, his treatment of light, the composition, symmetry, and palette. When I finished, my mother said, "It must have been so hard for her." Mine was the eye of a critic; hers was the eye of a mother. Thirty years have not dimmed my recollection of a night at the opera with my parents. We were close enough to see that the baby the soprano was holding was a doll, but when in a traumatic scene she dashed it to the ground, my mother let out a cry that could be heard by the prima donna. I was young enough then to be embarrassed. I am old enough now to know that such a cry has been the salvation of whole civilizations. A while before my mother died, her mind began to grow tired. Often at the end of a day, she would seem to be imagining things that were not there. At sunset she would look at me and ask, "Where are the children?" She had been one of nine children and had cared for many. But she was not imagining what was not there. She could see that childhood itself is missing from the very life of our culture. This was a long memory, of Rachel weeping for her children who were not. Our Lord had some officious followers who wanted to prevent children from seeing their Messiah. He said, "Let the little children come to Me and forbid them not, for such is the kingdom of heaven." Though very gentle, my mother would not tolerate anyone's criticism of four persons: the pope, because he is the pope; the queen, because she is the queen; the late Terence Cardinal Cooke of New York, because my parents were the last he received into the Church before he died in 1983; and Mother Teresa of Calcutta, because she was such a good mother. 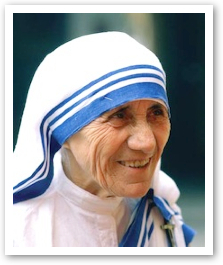 I once listened to a conversation between Mother Teresa and my mother at a meeting in the Bronx. They were like two neighbors chatting over a backyard fence. It was so cheerful and spontaneous and natural that it seemed childlike. When my mother was unconscious a few hours before her death, I sang to her some of the hymns she had taught me as a child. Then I whispered in her ear, "Mother Teresa, pray for my mother." My mother opened her eyes and said, "Love." As the power of the Most High overshadowed the Blessed Virgin, the Holy Spirit said in whatever music the Holy Spirit utters, "Love," and then Love Himself was conceived in her womb. My mother died in the hospital at 20 minutes after one on a Sunday morning. The grandfather clock in her empty house stopped at the same moment. A theologian might be too intelligent and clever to think about that. A child would take it for granted. The epitaph of John Henry Newman reads: "Ex umbris et imaginibus in veritatem" (out of the shadows and imaginings into the truth). Not near the truth or around the truth but into the truth. Christ is the truth. When He rose victorious over death, He stood on the shore of the Sea of Galilee at the moment before dawn. He raised his hands with holes in them, calling out to the apostles in their boat, "Children, have you caught anything yet?" These were grown men and strong men, but when they heard Him call, "Children," it was like heaven. Rev. George Rutler. "Behold Your Mother." Crisis 19, no. 5 (May 2001): 62-63.